Dutch firm MVRDV has unveiled plans to build a Y-shaped house with a swimming pool cradled into its angular roof. Called Y House, the unusual villa will form part of a new residential community on the outskirts of Taiwanese city Tainan. 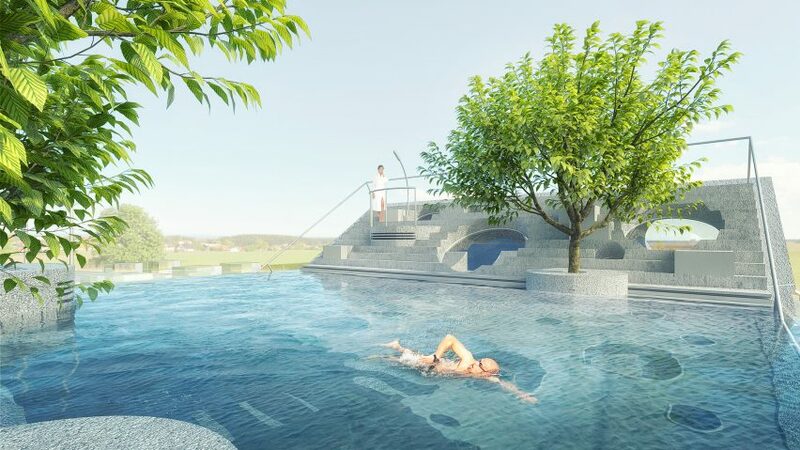 It will be used as a holiday home – one of the reasons why the swimming pool was given so much importance. "Y House looks set to become the focal point," said MVRDV, which is led by architects Winy Maas, Jacob van Rijs and Nathalie de Vries. "The proposal gives an identity to an otherwise nondescript site, standing out amongst the rest, and marking the development from a distance." The 330-square-metre house will be constructed from concrete. Large circular holes will form windows in the exterior walls, but will also puncture some internal partitions and floors. The living room will be located on the uppermost floor, where the building is at its widest. Here, circular openings in the ceiling will offers views up into the swimming pool overhead, and allow dappled light to filter in. Changing rooms and a solarium will be located on opposite sides of the dining space, one level below. Staircases will span this room at both ends to follow the angle of the Y, but will be divided up by curving pathways leading to the roof. Furniture will be integrated into the concrete form, for instance, a dining table will extend out from one of the staircases. "A landmark in and of itself, Y House's distinct concrete facade with circular window openings creates a light-filled experience, with its furniture integrated fully into interior spaces," said MVRDV. Bedrooms will be located on the lower levels, including a master suite, two children's rooms and a guest bedroom. A landscaped garden will be created around the building's perimeter, designed according to the principles of Feng Shui – a system that aims to create harmony among objects. This garden will include a small pool, lawn and planting areas, all dotted with circular stepping stones. MVRDV's office is located in Rotterdam – a city that is fast becoming a hub for architectural innovation. But the firm doesn't often work on commissions for private houses. The few it has designed include the staggered Haus am Hang in Stuttgart and the cantilevered Balancing Barn in eastern England.